A stunning Parentesi diamond pendant necklace from Bulgari. This necklace features a steel pendant set with .90ct of the finest Bulgari round brilliant cut diamonds in 18k gold. 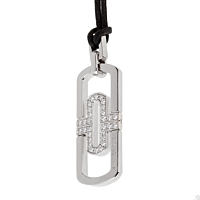 The pendant is suspended by an adjustable necklace that extends up to 24 inches in length. 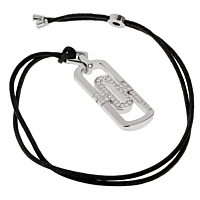 This pendant necklace features a unique design that showcases the quality of the materials and really makes a statement.